So the Tidewater Quilters' Guild Quilt Show 2018 is in the books. 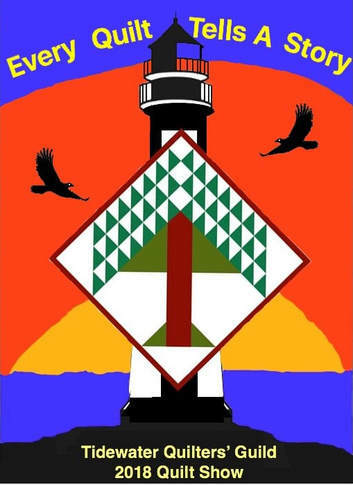 It was a fabulous show, full of fun, friendship, finely crafted quilts and a fantastic array of local and out of area vendors. We added at least four Stick-It-To-Me pin cushions to our collection and I'll need to work off two pounds of cookies from The Custom Cake Shop. Not Forgotten QOV, once again, was the recipients of a gracious invitation to set up a booth, meet up with old friends and QOV Volunteers and introduce many others that were not aware of the Foundation and its Mission. We are already looking forward to the 2020 show. Our heart felt thanks to Karan Fisher, Show Chair, the Quilt Show Committee Members, all the volunteers and members of the Tidewater Quilters' Guild for allowing us to participate in this years show. The overall theme this year was close to home, like every service member, veteran and Quilt of Valor..."Every Quilt Tells A Story." What a memorable experience for Elaine and I...again. Elaine had the hand crank Singer up and running much of the time making blocks for future QOV's. But for a short time on Saturday she had to leave. 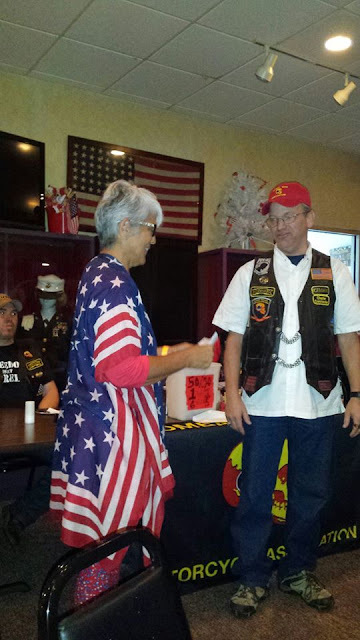 She went to the Combat Veterans Motorcycle Associations Monthly Meeting...with good cause. We really don't have abundant time or space to thank the Association enough. A life span would be to short. Now there is a slight amount of bias here. We are both members of CVMA, myself a Full Member and Elaine is a member of the Auxiliary. They live by the creed of "Veterans Helping Veterans" Many of the Full Members, Support Members and Auxiliary proudly express that on their vests with the embroidered patch "Vets Helping Vets." The list supporting that creed, Nationwide by Chapters like ours, Virginia 27-1, is truly endless. This year CVMA 27-1 selected Not Forgotten QOV to be the recipients of the proceeds from their annual "Ride to Remember." Elaine accepted the check at the meeting. 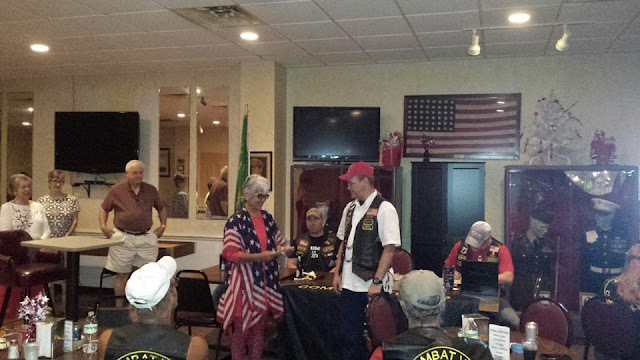 Accepting the check from Commander Mike "Iceman" Arndt. Elaine's smile is not as big as the check. 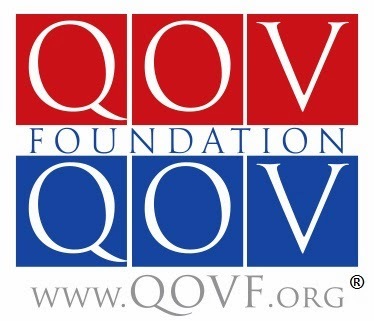 The donation to Not Forgotten QOV will go along way to replenishing supplies of fabric, threads, batting and notions to continue our efforts to award comforting and healing Quilts of Valor to our deserving service members and veterans. In attendance from Not Forgotten QOV are volunteers standing on the left, from left to right Nell, Paula and Gene. I should mention here that Gene won a Blue Ribbon First for his quilt "Barn Raising Under the Stars" at this years Quilt Show in the "Hand Quilted Pieced" category. Congratulations Gene. We Raffled off a $100 Gift Certificate for Longarm Services from thee Leatherneck Kilted Quilter. Our winner, Becky, is a new quilter and was certainly a happy new quilter with some longarming service to look forward to in the near future. Congrats Becky. The longarm has been busy...and there is no end in sight. Alwasy plenty of QOV's in queue. You might recognize this from a short video on Elaine's Facebook Page and thee Leatherneck Kilted Quilter's Page. This was our grandson's first quilt. He picked the theme panel the and border fabrics. He did some sewing and some longarming as well. We'll make a quilter out of him yet. There is always time for a baby quilt. Always fun to longarm a baby quilt. As a reminder...we are close by. We are getting a fair amount of traffic on the website... wequilt.org. It is on the website where you'll find two Photo Gallery slide shows. You might see one of your QOV's in one. The other is directed towards other quilting activities we are part of and other quilts I have longarmed. On the website you will find a link where you can contact us via our Yahoo address wequilt@yahoo.com. There is a calendar that we keep updated with upcoming events and sew days and when possible we will post upcoming QOV Awards were we have the authorization to invite Not Forgotten QOV Volunteers. 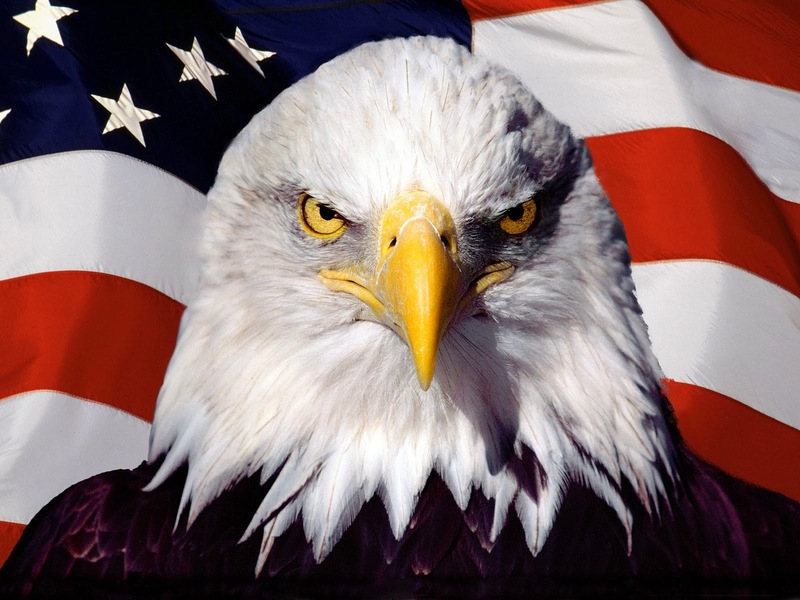 On those occasions where we have assistance from NFQOV Volunteers our gratitude would overflow Hoover Dam. Without you we don't exist. So proud to be a part of such sincere and dedicated quilters who are committed to our service members and veterans. As a Vietnam Combat Veteran there is a place in my heart that for a long time was just a void...you have filled that void. The blog is getting a little more of my attention, Elaine's Facebook Page is very active and now there is a new page that I manage from my personal FB page, Thee Leatherneck Kilted Quilter. If you get a chance pay it a visit. No, we aren't going to tweet. Instagram is a thought...but not currently on the calendar. As silly as it might sound...if I'm attending to social media...I'm not longarming. I already take enough time away from the longarm room with golf and the motorcycle. I must admit three passions makes for busy days. I've told Elaine I need to get a full time job so I can get some rest. This is a fact...not an unconfirmed rumor. Just ask Elaine. Why else would she say, "You are just the same as when we met." We met when we were 15.